The Point RV Park, OPEN YEAR-ROUND, features 32 sites with full hookups, overlooking beautiful shoreline on the lake's north end. Each site offers water, 50-amp electrical service, sewer, and 14' x 50' pads to accommodate larger RV's. For a more natural experience, set up camp in one of the 40 basic sites (no hookups) at the Oak Slope Campground, Open mid-March to mid-October. Small trailers are allowed in the Oak Slope Campground, but anything over 24' is STRONGLY not recommended. All campsites include a campfire ring and picnic table and a nearby restroom/shower building in both areas. RV Park and Campground Reservations are recommended but not required, and may be made online or by phone through the Parks Office, 15 calendar days to 9 months in advance of the first night's stay. If you require a larger space, be sure to utilize the Group Campground area, which can accommodate up to 100 people. 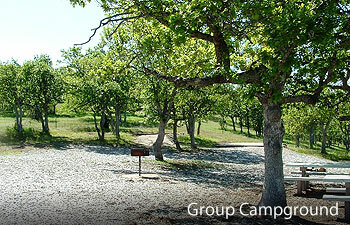 Group Campground area offers several picnic tables, large campfire ring, standing barbecue, horseshoe pit and a restroom/shower building nearby, making it a perfect spot for a family reunion, business retreat, or any larger social gathering. Group Camp Reservations are required and must be made by phone through the Parks Office.